Crossman & Company Negotiates $5.5 Million Price in Sale of Neighborhood Retail Center in Austell, Ga.
Atlanta / Orlando – Crossman & Company, one of the largest retail leasing, management and investment sales firms in the Southeast, recently negotiated a $5.5 million price in the sale of the East West Shoppes, an 85,565 square foot neighborhood retail center in Austell, Ga. in the Atlanta MSA. Brian Carolan, Crossman & Company’s Director of Investment Sales, along with Senior Managing Director, Bruce Lyons and the firm’s Chief Operating Officer in Atlanta John Zielinski, represented the seller in this transaction. The seller is Miami-based special servicer. A Boca Raton private investor is the buyer of the retail center. 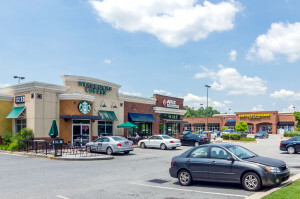 East West Shoppes consists of five buildings on a 15.74 acre parcel at 1025 East-West Connector in Austell in Cobb County. The center was constructed in phases between 2001 and 2004 and was 75 percent leased at the time of the sale. Major tenants include Starbucks, Discount Tires, American Family Insurance and Apex Animal Hospital. Crossman & Company will continue to lease and manage East West Shoppes.